A CD in C major - Haydn at his most festive! But Haydn would not be Haydn if he failed to include a few humorous digressions and surprises. For example, in the famous Symphony No. 48, nicknamed "Maria Theresa" - one of the composer's mostr dramatic scores in the key - Haydn called high-pitched C-alto horns and drums - to commemorate the visit of Empress Maria Theresa to Eszterháza in 1773. Similarly, the C Major Symphony No. 56 is another magnificent piece, which, like No. 48, calls for C-alto horns and drums in addition to some comic and grotesque writing for the bassoon. In view of the musical demands of these pieces, it is clear that Haydn's orchestra consisted of well-trained, excellent musicians indeed. In this instance, the Heidelberg Symphony Orchestra is no different! 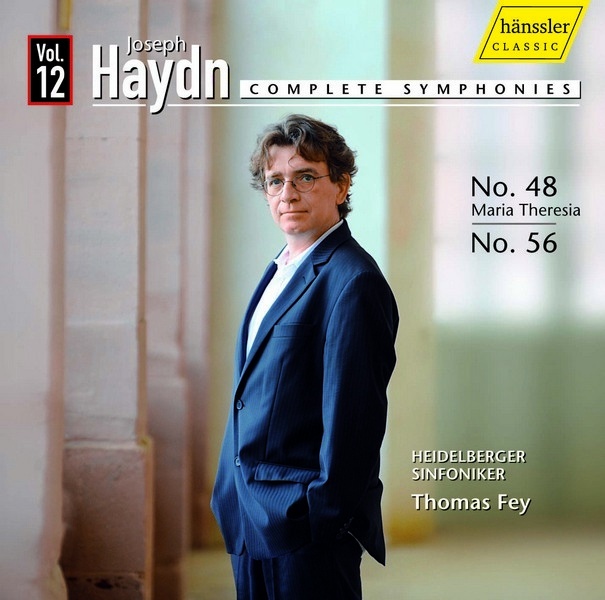 Every new release of Haydn symphonies from Thomas Fey and his ensemble is greeted with enthusiasm; truly this is how Haydn should sound today. To bring this about, Fey's musicians bridge past and present, performing both on modern string instruments and replicas of authentic period woodwind, brass and percussion instruments.